The PMDX-422 has been replaced by the PMDX-416 which adds opto-isolation to the inputs and allows direct to panel mounting. Support for the PMDX-422 has NOT gone away. It continues to utilize the same Mach4 plug-in as our other SmartBOB USB products. connecting CNC machines to the Mach4 family of software using a USB port. 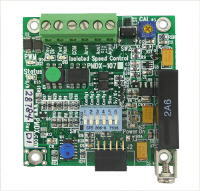 For simple systems the PMDX-422 provides all the required buffering, filtering, and pull-up resistors needed to directly connect to stepper motor drivers and the limit/home switches for controlling a machine, plus a 10 ampere relay to control spindle on and off. 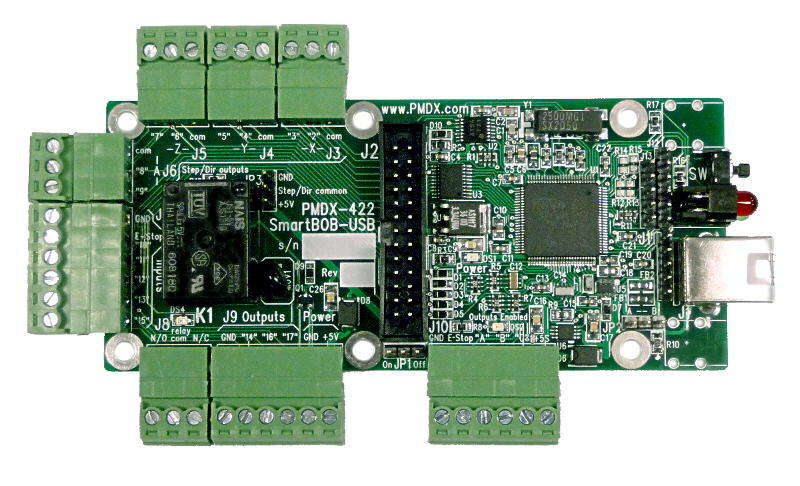 The PMDX-422 can also be connected to your existing breakout board using a 26 pin ribbon cable and will support the features of that breakout board including (if provided) optical isolation, a "charge pump" and spindle speed control. an additional $5 on our already discounted price for Mach4. 1) A single board implementing both the breakout board function AND the motion controller function saves cost and makes installation simpler. Use of option jumpers has been minimized by controlling features via software. 4) Power can be supplied via the USB connection or by a local power source connected to the terminal strips. Also, a jumper can enable or disable +5 volts on pin 26 of the ribbon header interface for use with devices that supply power on this pin. 5) The machine interface provides equivalent signals to one parallel port including 8 step and direction signals, 8 input signals including one dedicated to emergency stop, and 4 output signals including one used to control the on board relay. The first 5 inputs equivalent to those on a parallel port are available on both the terminal strips and the ribbon header. The extra 3 input signals are available only on the terminal strips. In the future these inputs will also function to provide a single encoder input supporting phase signals up to 1 MHz using a hardware quadrature decoder. The index signal will also be supported. This will make lathe CSS and threading possible. The functional capability of the PMDX-422 is very similar to the capability of a PMDX-122 breakout board plus 3 additional input signals. 6) The machine interface is available as both pluggable screw terminal connectors and as a 26 pin ribbon header. It is possible to use the terminal strips for limit and home switches while using the ribbon header to connect to a stepper driver or motherboard such as the PMDX-134. 7) The input signals have a pull-up resistor to allow use with simple mechanical switches or three-wire NPN proximity switches. These signals are filtered to reduce noise sensitivity. The inputs will also accept 5 volt logic signals. PNP proximity switches will require external adaptation using a PMDX-105 or similar. Beginning with Rev C, all inputs are protected against voltages up to 50 volts above ground. 8) The PMDX-422 will work the PMDX-126 breakout board running in Expanded Input mode to allow 10 inputs including emergency stop from the PMDX-126 and also the 3 extra inputs on the PMDX-422, giving a total of 13 inputs when used with a PMDX-126 in Expanded Input mode. This is mentioned only because it is technically possible. The PMDX-410 offers the same benefits in less space and at lower cost. 9) The step and direction outputs are 5 volt logic signals with up to 24 mA of drive current available. The "common" connection for the step and direction outputs is jumper selectable to be either Ground or +5 volts. 10) The relay output provides both normally open and normally closed contacts rated for up to 10 amperes at up to 240 VAC. The normally open contacts are equipped with an arc suppression snubber for longer contact life. An LED is provided to show when the relay is activated. 11) The three logic level outputs are 5 volt signals with up to 24 mA of drive current available. These signals can be used to drive solid state relays or the PMDX-104 light duty 4 channel relay board. 12) All outputs are turned off in the event of loss of communication from the host, or if the emergency stop input is activated. 13) The emergency stop input is a normally closed circuit for failsafe operation. A break in the circuit will signal an emergency stop. 14) An LED is provided for "Enabled" to indicate that the unit is ready to run the machine and as an aid in troubleshooting. Beginning with Rev C there is a "Steps" LED to indicate that motion is in process. 15) The board can be mounted against a panel with holes to allow access to the USB jack, pushbutton, and status LEDs. 16) Externally visible LEDs show status of host connection and the SmartBOB-USB board. 17) An externally accessible pushbutton is provided for firmware setup and test. 18) The USB interface is protected against back feeding of power from a local source. 19) The USB interface has jumper selectable termination of the shield conductor of the USB cable. 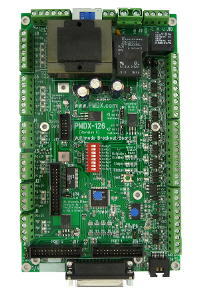 20) The PMDX-422 is a compact 4.5" by 2.0" board that fits in tight spaces. 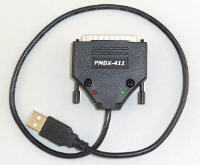 interface is available to work with the PMDX-422. without the terminal strip connections, relay, and associated electronics. as the PMDX-126, the PMDX-340, and the Geckodrive G540. needing more I/O and specialized interfaces like MODBUS. The PMDX-422 has been replaced by the PMDX-416 which adds opto-isolation to the inputs and allows direct panel mounting. The PMDX-416 can be purchased here.